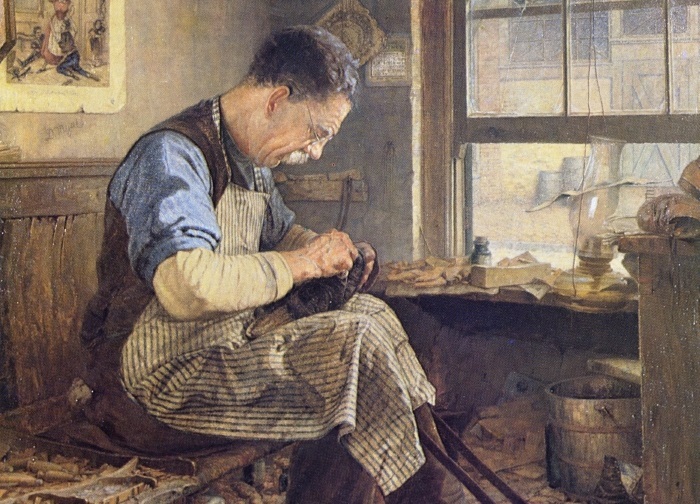 Detail from The Shoemaker, oil on canvas by American artist Jefferson David Chalfant (1856–1931). Courtesy of The Athenaeum. In 1949, prompted by the expansion of educational institutions under the G.I. Bill and assisted by his wife, Bernard Malamud submitted applications to over two hundred schools to become a teacher of literature. One of the few replies came from Oregon State College in Corvallis, a state-endowed institution specializing in agricultural topics, with liberal arts constituting “the Lower Division.” Appointed in July, he was hired to teach freshman composition—but not literature, because he didn’t have a Ph.D. He moved his family from New York City to Corvallis, where he conducted class three days a week and spent the other four days writing. I was overwhelmed by the beauty of Oregon . . . and the new life it offered, which I lived as best I could as I reflected on the old . . . [Almost] without understanding why, I was thinking about my father’s immigrant life (how he earned his meager living and what he paid for it). . . . I tried all sorts of things but at last resolved to do simple stories about simple people. I did about ten of these, concerned mostly with Jewish and Italian storekeepers and their three-walled, plate-glass-windowed world. Within a year, he had published three stories; the third, “The First Seven Years,” was accepted (“to my surprise,” Malamud admitted) by the prestigious Partisan Review, and the trio of stories brought him to the attention of Robert Giroux at Harcourt, Brace and Company, who asked Malamud if he happened to be writing a novel. The author responded that he was working on a “baseball novel,” and this debut book, The Natural, was published in 1952. 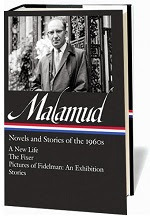 Known chiefly for his imaginative portraits of Jewish characters, communities, and themes, Malamud takes advantage of the Yiddish he learned from his parents as a child and adapts it to suit his aim of being an American and indeed a universal author as well as a Jewish one. Consequently, he often blends Yiddish and English into Yinglish, a style that includes Yiddish syntax and phrasing without necessarily incorporating actual Yiddish words, which he uses but sparingly in his fiction. The critic Robert Alter once identified this story as one that “will be read as long as anyone continues to care about American fiction written in the 20th century.” And, indeed, it is often included in anthologies and taught in schools, and it can of course be found in the newly published Library of America edition collecting Malamud’s fiction. Note: As the end of the story indicates, Sobel will have served as Feld’s apprentice for a total of seven years, a reference to the biblical story of Jacob and Rachel (see Genesis 29:20–30). Feld, the shoemaker, was annoyed that his helper, Sobel, was so insensitive to his reverie that he wouldn’t for a minute cease his fanatic pounding at the other bench. . . . If you don't see the full selection below, click here (PDF) or click here (Google Docs) to read it—free! This selection is used by permission. To photocopy and distribute this selection for classroom use, please contact the Copyright Clearance Center. This is the first tale in Malamud's The Magic Barrel, which always made me think of the phrase, a barrel of monkeys, and truly, there are a gaggle of people in that book, all types and ages and conditions of people, and all of them observed closely, but never narrowly, always with compassion. So I didn't read the story on my screen, but took the book down from my shelf and turned the pages, and read, and like always, when I turned the last page (15 to 16), and read the last phrases, I got a little catch in my throat, and a half a tear. Such human understanding, such depth of emotion, in a few brief, beautifully crafted pages. I've read this book over many times through the years, and it never fails to move me. hi - just so you know, which didn't seem to be inferred by your intro, "Yinglish" was a normal speech pattern to European Jews, at least in New York. I used to use the phrases once in a while myself, maybe I'll remember how when I read the story. 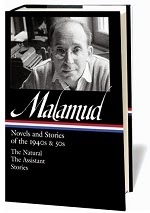 I am embarrassed to say, but I have never read Malamud; stayed away because I thought he wrote about horrible things of the war. This is beautifully written, warm story - emotions that I remember people used to have. Being poor and educated, there was depth to feelings and life. I miss that in the movies and books written now. I will read more - thanks. . .